The Bauer Palazzo gives the perfect taste of Venetian elegance to accompany your stay. Like a jewel on the edge of the Grand Canal, just moments from St Mark’s Square, the Venetian palazzo housing Bauer Palazzo combines modern luxury with sumptuous hand crafted Venetian fittings and furnishings. The hotel consists of two joining but quite different palazzo; one Art Deco where the marble-clad lobby is located, and the other a 19th-century faux Gothic palazzo that holds the main De Pisis restaurant. Classic Venetian elegance exudes throughout Bauer Palazzo, decorated with grand Murano glass chandeliers, carved stucco ceilings, antique furnishings and gilded mirrors. Speeding along the Grand Canal in our private water taxi from the airport, we turn into a smaller canal that brings us directly to the door of Bauer Palazzo. Tucked between Campo San Moisé and the entrance to the Grand Canal, there are just a few streets of luxury boutiques separating Bauer Palazzo from St Mark’s Square. From the hotel’s sun trapped terrace, views look out across the water to the beautiful Santa Maria della Salute. It would be difficult to find a better location for a short break in Venice. Our spacious room faced out to the Grand Canal with a small balcony to sit and watch the boats sail past. The sun shines on the front of the hotel all day and there is no better spot to enjoy being in the Floating City. Rooms are luxuriously and elegantly decorated, giving guests the opportunity to experience the grand Venetian lifestyle. 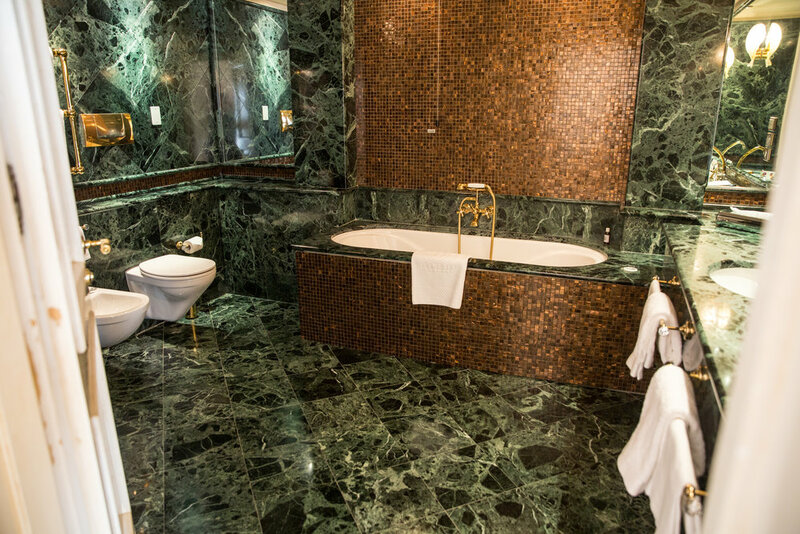 Large marble bathrooms have both a power shower and a large tub that was perfect to soak in after a long day of walking the canals. Watched over by Venice’s answer to the Statue of Liberty, the Bar Canale is the perfect spot to enjoy an afternoon cocktail in the sun. As the name suggests, it’s location on the banks of the Grand Canal provides a great spot to boat watch, with passing gondolas complete with tenors and accordion players, creating a wonderful atmosphere. The main restaurant at Bauer Palazzo, De Pisis, has canal views and modern, unfussy Italian cuisine. It was here that breakfast was served during our stay, with a wide selection of cereals, fruits and breads on offer. Settimo Cielo, on the hotels 7th floor is the highest terrace in Venice complete with panoramic views along the Canal. It is usually open throughout the day and is often the location for a breathtaking breakfast, but it was unfortunately closed during our stay. Staying at Bauer Palazzo during Venice Carnival automatically gives you a front row view of the Grand Canal. Having seen the masses of people lining the canals trying to get a good spot, the terrace at the Bauer Palazzo (only for hotel guests), was the perfect spot to take in the action. Boats lined up outside the hotel to kick off the Festa Veneziana on the water, where boats of sailors in fancy dress lined the Grand Canal ready to sail along accompanied by music. This is a really spectacular sight that is worth trying to time your visit to Venice to be able to experience. The Palladio Spa is located in Bauer’s sister property, the Palladio Hotel & Spa on the Giudecca Island, which is accessible via a complimentary boat ride. Along with the fitness room on the 8th floor, this was not open during our stay. After all of the walking in Venice, this wasn’t a big problem. But we will definitely be back in the summer months to enjoy more of the beautiful Bauer Palazzo. Wondering where to eat in Venice? Click here for top Venetian eats.